Dennis Wilson purchased the Stearns Manufacturing building in mid- April to use as a warehouse facility for the distribution and sale of propane cylinders. Dennis Wilson purchased the Stearns Manufacturing building in mid- April to use as a warehouse facility for his new business. Wilson hasn't given his latest endeavor a name yet, but it will be a sister company to Midwest Cylinder, another business he owns in Swift Falls. 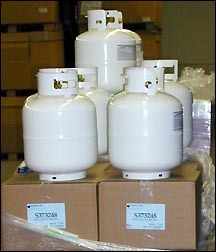 Wilson's newest business will focus on the distribution and sale of propane cylinders. The cylinders range in size from 20 to 100 lbs. A new law enacted changes in propane tank valves that will make them safer, said Wilson. His business in Swift Falls retrofits the valves while the Paynesville business and a distribution center in Florida concentrate on sales of new tanks and valves. Though he is unsure about how many, Wilson will eventually hire employees and has already enlisted the services of M-N Trucking. Wilson also hopes to lease the unused portions of the building. Wilson lives in Fort Pierce, Fla. where he operates another cylinder distribution business. He maintains a summer home on an area lake and winters in Florida. Having retired once, he is working on a second career. He has three children and five grandchildren. When he can find spare time, he likes to sit on the beach and read business journals.